It's should be pretty clear from the outside what you're in for on the inside. Front cover: is it Dracula walking away from his latest victim? Back cover: a graveyard! And inside the the booklet among other things, a quote from H.P.Lovecraft. 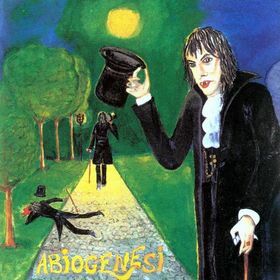 Unmistakably, you're in Black Widow territory, and Abiogenesi's debut is the label's latest release. From my understanding of the Italian song titles and a quick glance at the artwork in the booklet, it's clear that their focus is on the dark side of things. A four-piece of keys, drums, bass, and guitars/vocals, their sound is firmly rooted in the early 70s. The overall production style, the guitars with fuzz and wah-wah, the crunchy Hammond organ, and Mellotrons might have the listener guessing, but this really is a current band going about a faithful recreation of the 70s' spirit. Vocalist/guitarist Toni D'Urso's bluesy voice reminds me of several singers from the classic Italian era, while the pace of the music and the ways in which their compositions develop is right on track for '73. On a couple tracks guest musicians add violin, 12-string, and even harmonica. It's not until the last of six tracks ("Appuntamento con la Luna") where they manage to give away the secret by allowing a few neo-isms to creep into their mix. In all, this is an excellent release, one that grows better with each listen.